Hints of Bubbles in the Background? Looking around for a hot cosmological topic for a brief diversionary post, I came across a news item on the BBC website entitled ‘Multiverse theory suggested by microwave background‘. I’ll refer you to the item itself for a general description of the study and to the actual paper (by Feeney et al. ), which has been accepted for publication in Physical Review D, for technical details. I will, however, flagrantly steal Auntie Beeb’s nice picture which shows the location on the sky of a number of allegedly anomalous features; they being the coloured blobs that look like Smarties in the bottom right. The greyed out bits of the map are areas of the sky masked out to avoid contamination from our own Galaxy or various other foreground sources. One possible explanation of the Smarties from Outer Space is furnished by a variant of the theory known as chaotic inflation in which the universe comprises a collection of mini-universes which nucleate and expand rather like bubbles in a glass of champagne. 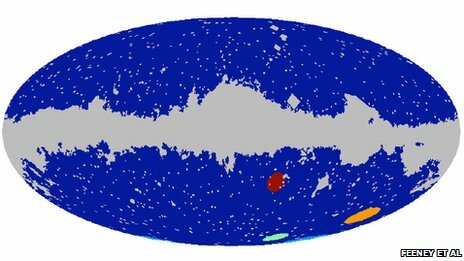 Assuming this “multiverse” picture is correct – a very big “if”, in my opinion – it is just possible that two bubbles might collide just after nucleation leaving a sort of dent in space that we see in the microwave background. It’s a speculative idea, of course, but there’s nothing wrong with such things. Everything starts off with speculation, really. I’ve actually read the paper, and I think it’s an excellent piece of work. I can’t resist commenting, however, that there’s a considerable gap between the conclusions of the study and the title of the BBC article, either the present `Multiverse theory suggested by microwave background’ or the original one `Study hints at bubble universes’. My point is that the authors concede that they do not find any statistically significant evidence for the bubble collision interpretation, i.e. this is essentially a null result. I’m not sure how “study fails to find evidence for..” turned into “study hints at…”. Nonetheless, it’s an interesting paper and there’s certainly a possibility that better, cleaner and less noisy data may find evidence where WMAP couldn’t. Yet another reason to look forward to future data from Planck!